Chemotherapy-induced nausea and vomiting (CINV) is a major concern for cancer patients and, if uncontrolled, can seriously compromise quality of life (QOL) and other treatment outcomes. Because of the expense of antiemetic medications used to prevent CINV (particularly oral medications filled through Medicare Part D), disparities in their use may exist. 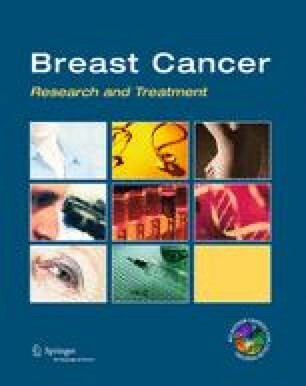 We used 2006–2012 SEER-Medicare data to evaluate the use of neurokinin-1 receptor antagonists (NK1s), a potent class of antiemetics, among black and white women initiating highly emetogenic chemotherapy for the treatment of early-stage breast cancer. We used modified Poisson regression to assess the relationship between race and (1) any NK1 use, (2) oral NK1 (aprepitant) use, and (3) intravenous NK1 (fosaprepitant) use. We report adjusted risk ratios (aRR) and 95 % confidence intervals (CI). The study included 1130 women. We observed racial disparities in use of any NK1 (aRR: 0.68, 95 % CI 0.51–0.91) and in use of oral aprepitant specifically (aRR: 0.54, 95 % CI 0.35–0.83). We did not observe disparities in intravenous fosaprepitant use. After controlling for variables related to socioeconomic status, disparities in NK1 and aprepitant use were reduced but not eliminated. We found racial disparities in women’s use of oral NK1s for the prevention of CINV. These disparities may be partly explained by racial differences in socioeconomic status, which may translate into differential ability to afford the medication. The online version of this article (doi: 10.1007/s10549-016-3747-6) contains supplementary material, which is available to authorized users. This study used the linked SEER-Medicare database. The interpretation and reporting of these data are the sole responsibility of the authors. The database infrastructure used for this project was funded by the CER Strategic Initiative of UNC’s Clinical & Translational Science Award (UL1TR001111) and the UNC School of Medicine. Ms. Check is supported by the National Cancer Institute under Award Number R25CA116339. Dr. Dusetzina is supported by the National Institutes of Health Building Interdisciplinary Research Careers in Women’s Health (BIRCWH) K12 Program and the North Carolina Translational and Clinical Sciences Institute (UL1TR001111). Drs. Weinberger and Zullig are supported by the Department of Veterans Affairs Office of Health Services Research and Development (Grant No. RCS 91-408 to MW and Grant No. CDA 13-025 to LLZ).